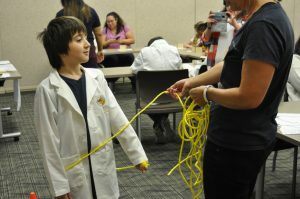 We had a great time working with STEM Scouts at their event called STEMQuest. STEM Scouts is a program launched by Boy Scouts that brings STEM development opportunities to elementary and middle school students. 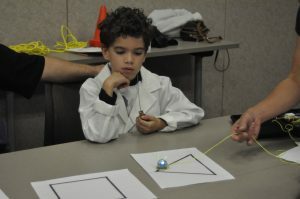 To learn more about STEM Scouts in Central Texas, visit their Facebook page linked here! 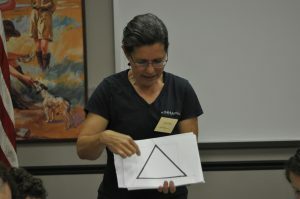 As part of STEMQuest, MathHappens brought three different activities which all related to angles. 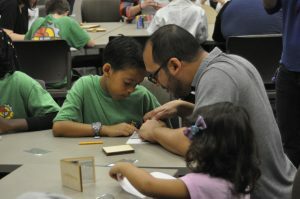 We also invited the STEM Scouts to invite their parents over to do the activities with them so parents could learn, too. The first activity, led by Lauren, involved using Ozobots to study external angles in polygons and to learn more about our moon’s motion. The sum of all the external angles of a polygon always add to 360 degrees. One way to show this is to attach a string to an Ozobot on one end and hold the string with your hand on the other end. As the Ozobot travels the total path of a polygon, the string will wrap around the Ozobot once. Another way to show this is to walk around some cones laid out on the floor while holding a piece of rope. You’ll notice that the rope wraps around you once, just like on the Ozobot. Another interesting example is our moon. It rotates once while it revolves around the Earth once. This is why the same side of the moon always faces the Earth, and the Ozobots did a great job of displaying this. The STEM Scouts then used markers to make their own paths that the Ozobots could follow. Lauren shows off a triangular path. The Ozobot follows the triangular path. Now the Ozobot follows the pentagonal path. This STEM Scout now takes the place of the Ozobot in a human-sized version of the activity. The second activity, led by Paola, involved using our tried-and-true mirror books to study how different central angles can lead to differently-shaped polygons. The STEM Scouts opened and closed their mirror books in different amounts on a straight line to find the different shapes they could make. Some STEM Scouts even used their protractors to be more accurate with the angles they were making. Awesome! The mirror book reflects anything: lines, shapes, even fingers! This is a clever use of the newly-acquired protractor with the mirror book. This family works together on the mirror book activity. The third activity, led by Abdulkarim, focused on the navigational quadrant, which uses a plumbline and angles to tell you your latitude when viewing the north star and helps you figure out your distance from tall objects, such as a lighthouse when you’re on a ship. In this activity, the STEM Scouts learned how to use the quadrants with a partner. The STEM Scouts were asked to find the “lighthouse” in the room, which was taped high near the ceiling. After that, STEM Scouts were asked to view the lighthouse through their quadrants and to note the angles at different distances in the room: once far away from the lighthouse, once from the middle of the room, and once closest to the lighthouse. Then everyone sat down and shared what they observed. All groups noticed that as they got closer to the “lighthouse,” the angle on the quadrant got bigger. 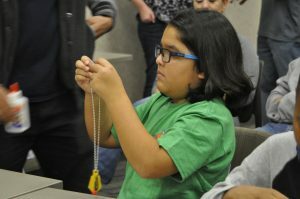 Afterwards, everyone got to decorate and keep their own plumbline necklaces. This STEM Scout practices how to use a quadrant properly. Working as a team helps when reading the angle on the quadrant. Abdulkarim helps to assemble the plumblines. This STEM Scout decorated her plumbline and is almost ready to wear it as a necklace. 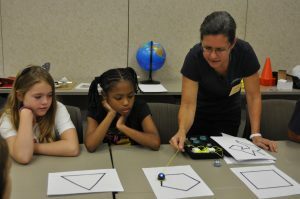 We had a great time working with the STEM Scouts and their parents on this Saturday morning, learning all about angles. 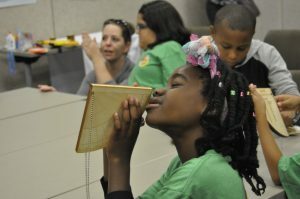 Thanks to STEM Scouts for having us and special thanks for providing us great photos of our activities. We look forward to working with STEM Scouts again!